This pizzeria opened less than one year ago, across the road from the popular cultural space Lanificio159. 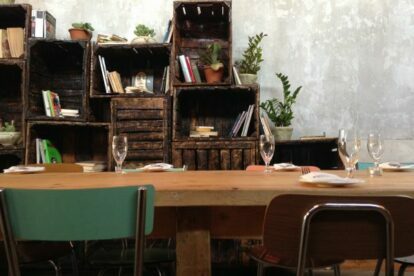 Without implying that the food isn’t good, the best feature of this restaurant is the vintage-hipster furniture: every time I go there, I can’t stop myself from taking pictures! Lunch there is an open buffet, where you can find Roman pizza but also cheeses, cold cuts, fried food, salads and desserts. At dinner, the menu is the same, but you will get your food at the table. Here the Roman pizza isn’t s thin as in our tradition, as the 72-hour rising makes it especially soft (which I prefer! ), and it is topped with the finest ingredients, mostly from local producers. I also love their signature ‘polpette’, literally ‘meatballs’, even if they can also be made up of rice, breadcrumbs and other ingredients. My favourite ones are the ‘polpette alla parmigiana di melanzane’, deep-fried balls made up of aubergine, tomato sauce, basil and both mozzarella and Parmesan cheeses. After the meal, don’t forget to explore one of the most fascinating neighbourhoods in Rome!